The Earhtworks Perform Portable Massage Table is a relatively new table to the market. 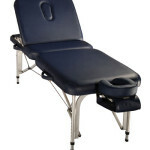 It is a massage table with a lifting back rest so clients and patients can be seated or raised for treatments. This comes in handy for treatments such as reflexology and for when you want to leave people seated after the treatment to catch a breath and relax a little before they leave. This is especially handy for elderly clients. If they are lying prone for a long time they can be a little dizzy afterwards to i would normally turn them around supine and raise them up to around a 60 degrees angle. At 15.8Kg and 28 inches wide, it is the lightest full dimension professional massage table with a back rest on the market. You will find lighter tables with back rests but they are not full width. They usually reduce the weight by reducing the table size. Earthworks have made the table so light by using a very high quality aluminum and excellent build quality. One feature I love about this massage table is the very high end access panels (a.k. reiki end panels). Anyone can sit at the end on a stool and fit their legs under the massage table. 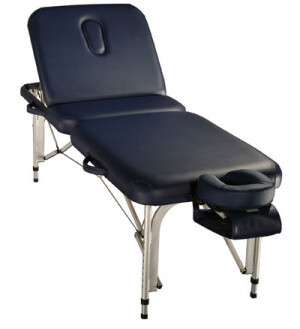 As with all massage tables in this price range, the PU leather and foam are far superior to anything else on the market. The head cushion is very comfortable at 9cms thick, and it fits into both ends of the table. The end you are not using, you can put another accessory in the holes such as a couch roll holder. One SUPER feature of this table which I rarely find on massage tables is that the head rest cushion remains in the back rest portion even when you raise the the back rest up. This comes in really handy for resting the head. A little trick I use is to turn the horse chose cushion around so the open section is facing away from the table when the back rest is raised. The cushion then sits nicely under the occipital bone, supporting and relaxing the neck muscles. The lifting back rests raises smoothly into each height setting and goes up to around 75 degrees. As with all aluminium tables with these types of legs, it is very easy and quick to adjust the height setting. I tested it and it took me 9 seconds to adjust all 4 legs. This massage table comes with a very nice, heavy duty carry case. I don’t own this model myself but one of the clinic I work at has it in all it’s treatment rooms so I get to use a few times a week. It gets my second place recommendation. I docked half a star as the carry case only comes with one pocket on the outside. I like to use the cases with numerous pockets on the outside so I don’t have to carry a second bag for accessories. I rated the weight 8/10 as although this is the lightest table in the “with back rest” style, it is still a lot heavier than a table with no back rest. Therefore, if you don’t use or need the lifting back rest, choose a flat massage table to save weight.